our fall covergirl chats with us about her office decor style. Our Fall 2015 cover girl chats with us about maximalism, personal touches at the office, and Sour Patch Kids. Needless to say, we’re listening. 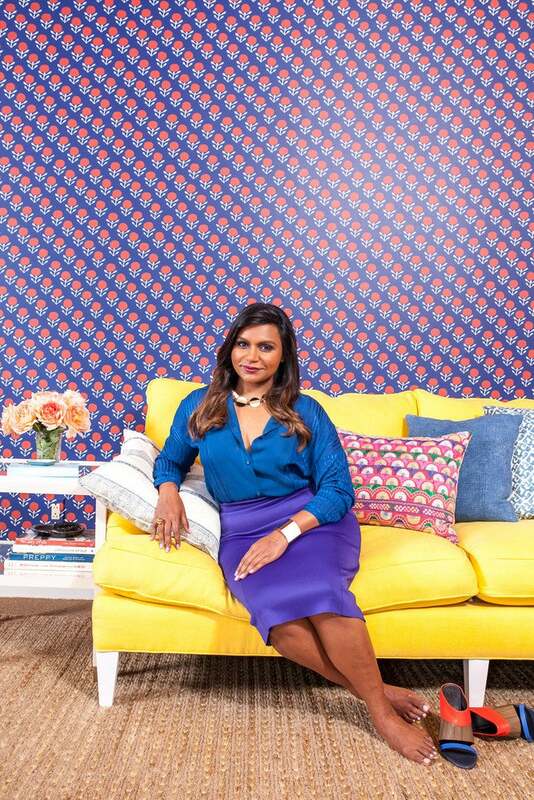 Read on to learn more about Mindy, and don’t miss her cover story here! WHAT DECOR ELEMENT DO YOU LOVE THAT EVERYONE ELSE HATES? I love bright patterns and colors. All my LA friends are so minimalist, and I’m very maximalist. WE LOVE SEEING YOUR FASHION-FOCUSED INSTAGRAMS. DO ANY OF YOUR TASTES IN FASHION CARRY OVER INTO YOUR WORKSPACE OR HOME? I’ve always attempted to have a “less is more” aesthetic, but the problem is, I love stuff. I love layers and embellishments and complication. WHO IN YOUR LIFE HAS THE BEST SENSE OF INTERIOR DESIGN? My best friend Brenda Withers has always had the cleanest and most elegant sense of design. In college, sometimes she would have a bare wall and hang a beautiful dress on a hanger on it, as the only piece of “art.” This was when I had, like, a “You’ve Got Mail” poster up, so that was pretty impressive. HAS SHE EVER HELPED YOU STYLE YOUR HOME OR WORKSPACE? She could never begin to tame my sprawling tastes. WHAT DECOR ELEMENTS MAKE YOU FEEL MOST PRODUCTIVE? IF YOU COULD SPEND THE NIGHT IN ANY RETAIL STORE WHAT STORE WOULD IT BE? Dylans Candy Bar, of course. By morning I’d be dead of sugar poisoning. WHAT FRAGRANCE DO YOU KEEP AT THE OFFICE? DO YOU USE SIMILAR SCENTS AT HOME? I have an aversion to too much scent and have long thought candles were pretentious for some reason. Then my friend Ben Feldman (who played my boyfriend on my show) gave me a Jo Malone English Pear and Freesia candle and I lit it one day out of boredom. It smelled so good and now I’m hooked on candles. DO YOU BRING ANY DECOR ITEMS FROM HOME OR OFFICE WITH YOU WHEN YOU TRAVEL? No. I wish I was someone who had a favorite blanket that she brought with her on planes, but I lose all my stuff too much. ANY ADVICE FOR PROFESSIONALS WHO WANT TO MAKE THEIR OFFICE FEEL A BIT MORE PERSONAL? Most of my “artwork” is just framed private jokes from friends. Text exchanges and funny drawings. I love that, it always makes me smile when I look at it. WHAT IS ONE ITEM THAT’S BEEN PRESENT IN EVERY OFFICE YOU’VE EVER HAD? A cup or dish to hold Sour Patch Kids!